An Italian leading the St.Patrick's Day parade? Looks like it in Hoboken, New Jersey where 'cake boss' Buddy Valastro has been handpicked to do the honors. What next Tony Soprano strutting his stuff in charge on Fifth Avenue? 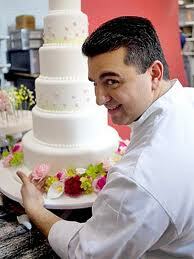 Buddy's show the Cake Boss attracts two million viewers a week on TLC. That apparently is good enough for St.Patrick's organizers in Hoboken. So Buddy gets to be Boss of Bosses in the New Jersey city across the Hudson from Manhatan on Green Day. Wake me up when September comes. Thats' when Paddy O'Shea will run the San Gennaro festival in Little Italy.